Warning: Scratchiez is known to cause extreme cases of wanderlust and untreatable breakouts of the travel bug! Do you spend your free time planning upcoming expeditions? Do you suffer from extreme bouts of jealousy whenever you hear people talking about their upcoming travels? Do you have an appetite for adventure that can never be satisfied? If so, you may be suffering from a severe case of wanderlust. Don't worry. You're not alone. You may be powerless against your frequent travel-filled fantasies, but Scratchiez is right here with you. Embrace the restlessness, buckle up, and enjoy the ride! Part souvenir, part to travel list. Don't just sit there thinking about all of the places you'd like to travel. It's a big world out there, so it's time to start seeing it! Scratchiez scratch-off maps may spice up any wall like a normal piece of wall art, but they're way more than that. They serve as exploration inspiration, while capturing your personal journeys like a living souvenir. Take the satisfying sensation of crossing places off your list to a whole new level, and scratch them off! Take your travels to the next level and add one to your cart TODAY! 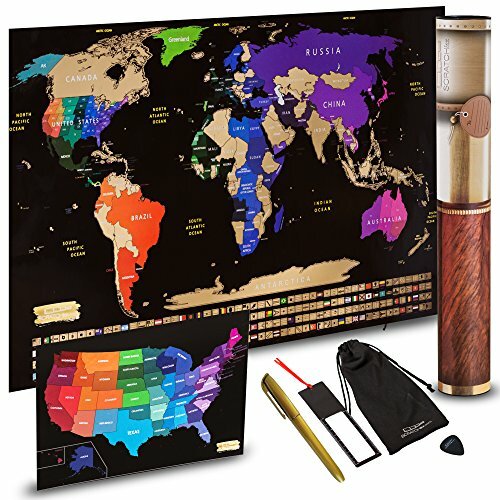 SCRATCH OFF MAP OF THE WORLD - The most detailed, accurate and beautiful scratch off map out there, our map features vibrant colors on a glossy black design. Printed on thickest 250GSM laminated paper to protect from unwanted scratches. Map comes in XL thick tube to ensure quality. A COLORFUL MAP TO MATCH A COLORFUL WORLD - Most scratch off world map posters make their countries boring brown, so it's hard to tell the scratched from the unscratched. Scratchiez knows you're proud of the ground you covered. That's why our countries and states are brightly colored, so you can show off all of the places you've crossed off your list! We've also outlined each state in the US and added 252 scratchable flags of the world to make check marking destinations all the more satisfying. GIFT A ROUND THE WORLD TRIP, MINUS THE PRICETAG - Tired of gifting trinkets that end up in the back of the closet and man cave, and gadgets that go unused? Shopping for the travelers in your life is no easy task, since they seem to be more focused on collecting experiences rather than things. Luckily, Scratchiez gives you a way to help the wanderers of the world capture their adventures and inspire new ones. With Scrathciez you'll finally nail the travel gifts category this holiday season! FIRST CLASS FREEBIES INCLUDING BONUS USA SCRATCH OFF MAP - You might travel economy, but with Scratchiez you can bump yourself up to premium for FREE! Upgrade your scratch off map adventure with some incredible bonus gifts, including a FREE Scratch Off Map of the United States, FREE Scratcher Tool, FREE Microfiber Cloth, and FREE Erasable Gold Marker! A GUARANTEE THAT'S OUT OF THIS WORLD - Unlike airplane tickets, Scratchiez doesn't penalize you if you change your mind. So if dreams of far-off places start to disrupt your daily functioning, or if this just isn't the scratch off travel map for you, have no fear! We offer a 100% satisfaction guarantee, in addition to our unbeatable lifetime warranty, so simply send it back for a full refund. If you have any questions about this product by SCRATCHiez, contact us by completing and submitting the form below. If you are looking for a specif part number, please include it with your message.